Learning a versatile, up-to-date welding skillset is one of the best ways to improve job opportunities. The more you know how to weld, the greater the number of positions that could be a good fit for you. Many companies are also looking for applicants with formal welding training. The good news is that welding school offers hands-on instruction in the core welding processes used in many industries. Gas tungsten arc welding, also known as “TIG” or “GTAW,” is one of them. While learning this precision welding process takes time, the exciting and potentially lucrative career opportunities that come with the skills could be well worth it. Think NASCAR, NASA and the petroleum industry. Check out more reasons to get excited about gas tungsten arc welding below. What Is Gas Tungsten Arc Welding? Similar to the other arc welding processes that are taught in welding training, gas tungsten arc welding relies on intense heat to melt and fuse metals. The differences lie in the type of equipment used. You’ll have the option to use either AC or DC with most TIG welders. The one you choose depends on the metal. AC works best with aluminum and DC with steels. Unlike in stick welding, the electrode doesn’t become part of the weld. It’s a non-consumable tungsten rod. After welding, it can be sharpened and reused. As with gas metal arc welding, a shielding gas is employed to protect the work from atmospheric contaminants. Inert gases argon and helium are primarily used for gas tungsten arc welding because they exclude reactive gases, such as nitrogen and oxygen, from the weld area. A flowmeter controls the amount of shielding gas released from the cylinder, and a hose transports the gas to the electric torch. An electric torch serves two purposes in gas tungsten arc welding: it holds the tungsten electrode that conducts the electric current to the arc, and it transports the cooling water, electricity and shielding gas. Torches can be found in varying capacities, sizes, amperages and shapes. When the welder needs to start or stop the weld or adjust the current, he or she uses a remote control. There are two options when it comes to controls: foot-operated pedals, which are better for seated welding at a work station, and hand or thumb controls for when welding while standing or working out of position. If a filler material is needed to build up or reinforce the workpiece, a welder can manually feed the metal rod or wire into the weld pool. Step 1: The process starts by selecting the type of current and turning on the electricity and shielding gas. Step 2: Next, the electric torch is directed at the work piece, so the tungsten electrode can convey the current to strike the arc and heat the metal. Note that the electrode should be held about an inch away from the metal and never touch it. As the metal is heated, a liquid weld pool forms. The torch releases the shielding gas at the same time. Step 3: If a filler metal is needed, the welder will feed it into the weld pool with the hand that’s not operating the electric torch. The strong bond is formed when the metal cools and solidifies. What Are the Benefits of Gas Tungsten Arc Welding? This process can be used on both ferrous and nonferrous metals. Any welding position works with gas tungsten arc welding. It can be used on thick or thin metals, with or without a filler metal. Plus, the TIG welder works for stick welding. Gas tungsten arc welding can be performed manually or adjusted to use with automatic equipment. It’s suitable for repair or production. An excellent process for small, precise and high-quality welds. No slag is produced, so cleaning the weld usually isn’t necessary. What Are the Drawbacks of Gas Tungsten Arc Welding? The process requires a high level of skill. Labor costs can be more expensive. Slower deposition rates and travel speeds can also increase the cost of production. It can take more time and effort to learn gas tungsten arc welding. If you’re new to using a TIG welder, it could take some time to get used to operating the foot peddle. If you’re using a filler metal and a foot peddle, the process can require dexterity because the welder will be left with only one free foot. Gas tungsten arc welding should only be performed on clean metals to avoid compromising the quality of the weld. Which Industries Use Gas Tungsten Arc Welding? Initially developed in the 1930s and 1940s by the aircraft industry, gas tungsten arc welding has come to be used in a wide range of industries. The great thing about welding school that it gives you hands-on training in the techniques and processes being used in many industries. 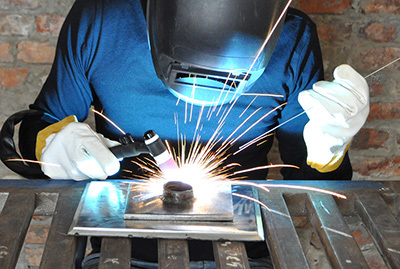 Along with GTAW, our welding training program offers instruction in shielded metal arc welding, gas metal arc welding and flux-cored arc welding. You’ll also learn important welding safety practices. At the end of the program, you’ll be career ready for entry-level positions across the field. Where can you take your skills after graduation? Read Where Are All the Welding Jobs? These States Have the Highest Employment.